These low dusting, rotor friendly formulations of performance brake pads offer high performance braking while keeping wheels cleaner than the competition! Akebono Performance brake pads offer braking power for drivers who have one thing in mind - performance. 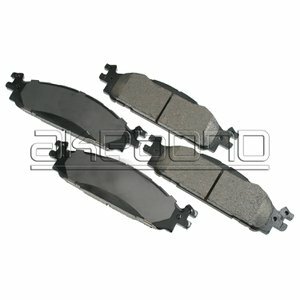 Made of the highest quality long-lasting material, these ceramic brake pads are ideal for the spirited driver or fleet driver who pushes a vehicle to its limit. Whether for intense driving, loaded up work trucks, SUVs toeing a boat, or even law enforcement vehicles, Akebono brakes pads can handle the job and outperform the competition. For the smoothest, cleanest, quietest braking experience - install Akebono Performance Ultra-Premium brake pads. The Akebono Performance Ultra-Premium Brake Pad line uses friction formulas developed specifically for fleet vehicles! Akebono has developed specific ceramic brake formulations for each vehicle model, assuring the best fit, performance and the safest braking experience. For the smoothest, cleanest & quietest brakes, choose Akebono Brake Pads. Akebono's Performance ceramic brakes virtually eliminate brake squeal, brake dust, brake roughness and actually extend rotor and the life of your brakes. These ultra quiet pads offer definitive control of noise, vibration & harshness (NVH). No break-in needed with these high performance brakes! The Pep Boys Say: "Akebono expertise in creating ceramic technology has allowed them to create this ceramic performance pad that performs at the levels required to deliver in extreme conditions." Akebono is the largest brake manufacturer in North America resulting in the unique advantages of original equipment experience and expertise backed by the most comprehensive Research and Development in the industry. Akebono is the leader in the control of brake dust, noise, vibration and harshness (NVH).